The ceasefire now in effect in the east of Ukraine is the first serious deal between the parties on a path towards a peaceful settlement. However, working out the details and negotiating a future status for the region that is acceptable to all parties will be a challenging task requiring compromise from all sides. The ceasefire in the east of Ukraine is a long-awaited step that has put an end to a brutal and pointless bloodshed. However, it has brought the sides no closer to an agreed solution and the political process ahead is likely to be very difficult. The first stage after exchanging prisoners would be to establish who controls what and delineate areas of responsibility. 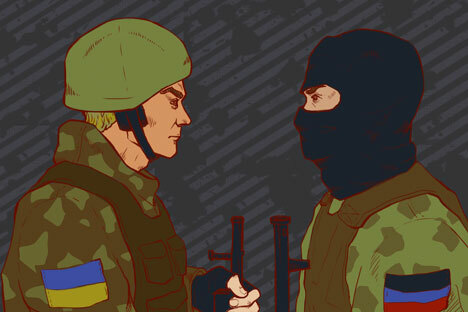 Any conflict of this type is a war without a clear frontline, so a "border" has to be agreed after the truce. Since in terms of international law, the territory of Ukraine is under Kiev's jurisdiction, while the Donetsk and Lugansk ‘people's republics’ do not have a recognized status, the agreement requires goodwill primarily from the Ukrainian side. Goodwill in this case implies the recognition that real control over part of the country has been lost, which is, of course, not easy and may cause serious upheavals in Kiev. After the demarcation, there comes the question of control over the line of contact. Since the OSCE has been involved in the political process from the very start, it would be logical for it to assume a monitoring function. To do that, it will need a mandate, so one can expect a heated debate in Vienna, where the OSCE is headquartered, as to the powers and makeup of the relevant mission. Next, talks about the region’s status should begin. The statements being issued by the involved parties make it impossible to assess the probability of reaching a compromise. Needless to say, statements made for the benefit of the public usually appear rather uncompromising, while behind closed doors, a more nuanced discussion is possible. However, the experience of other frozen conflicts involving breakaway republics, be it Transnistria (in Moldova) or Abkhazia and South Ossetia (in Georgia), shows that it is very difficult to reinstate control that has been de facto lost. Therefore, in order to secure Ukraine's territorial integrity, extra efforts and a very creative approach to autonomy rights are needed. It is, however, not clear to what extent Kiev is capable of this in the current circumstances. The political situation is heated, and far from everyone has welcomed the news of a ceasefire. In addition, the idea that Ukraine has more chances of establishing a stable national statehood without the Donbass first appeared even before the latest round of hostilities. So Kiev too may opt for freezing the situation. The authorities of the self-proclaimed republics now face the task of establishing administrative structures that should be grounded in some legitimacy. Therefore, there must be elections and, consequently, political parties taking part in them. In the previous frozen conflicts, declared autonomy or independence was followed by the emergence of strong individual leaders, like Igor Smirnov in Transnistria or Vladislav Ardzinba in Abkhazia. However, in eastern Ukraine there are no striking personalities who would enjoy unquestionable authority. Clearly, as in other similar cases, the role of ‘veterans’, i.e. the members and leaders of armed groups, will be quite significant. For instance, in Nagorno-Karabakh (a territory disputed between Armenia and Azerbaijan – RBTH) or Abkhazia, the ruling faction simply cannot perform its functions without the support of veteran groups or, rather, the political elite is formed primarily of members of the military elite. All the more so since the new entities will, naturally, be giving priority attention to the development and maintenance of their armed forces. The lack of a universally recognized political status means that the only guarantee of these territories' independence can be military strength. A separate strand is the interests of outside forces, which have significantly raised the stakes and the degree of tension in the conflict. Russia faces a difficult choice because the moral and financial responsibility for the territories that have de facto separated from Ukraine lies on Moscow. Obviously, economic assistance in rebuilding the Donbass will follow, but the lack of agreement on its status makes any investment there risky. An ideal scenario for Russia, it seems, would be a united Ukraine with considerable autonomy for Donetsk and Lugansk and guarantees for ensuring their rights and freedoms as parts of the neighboring country. Then assistance to those regions could be rendered as part of international efforts to restore Ukraine, which will inevitably follow. Furthermore, with these regions remaining part of Ukraine, it would create a certain lever of influence on domestic Ukrainian politics. However, the likelihood of such an agreement does not look high. Moscow will therefore have to assist in the establishment of the institutions of the Donetsk and Lugansk people’s republics (the titles are likely to change but could be used for now) without having clear prospects for the future. As regards the European Union, which has contributed to the crisis considerably, its priority task will probably be a search for partners in the task of rebuilding Ukraine, in other words somebody to share the financial burden. Ukrainian conflict: What exactly is Russia trying to achieve in the east? Europe has realized that without Russia's assistance, the task of restoring Ukraine will be unmanageable, so once the truce is signed, the Europeans will be searching for ways of interacting with Moscow in order to reduce the economic pressure on Kiev. The outcome of this is not clear, since at the same time the EU speaks of tougher sanctions against Russia, which, clearly, is not very conducive to an atmosphere of constructive trust. The most destructive position will belong to the United States, which views the Ukrainian crisis largely through the prism of its own strategic interests in Europe and the goal of containing Russia. The events of 2014 have clearly shown that there are fundamental processes still continuing in the former Soviet Union. They will affect the borders and the national consciousness of different peoples as well as the geopolitical balance of powers. The fate of eastern Ukraine is an element in a big and complicated future picture that we can so far only guess at. The author is editor in chief of the magazine Global Affairs and chairman of the board of the Foreign and Defense Policy Council, an independent body that contributes to the development of Russian political strategy.